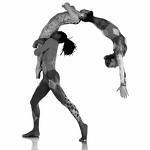 World Famous Pilobolus, Pilobolus is an internationally-renowned dance company, whose origins are traced. Pilobolus is an internationally-renowned dance company, whose origins are traced to a 1971 Dartmouth College dance class taught by Alison Chase; the founding members were Robby Barnett, Lee Harris, Moses Pendleton, Nicholas Bochte and Jonathan Wolken. The group first began performing in October 1971, and has been touring worldwide since that date, primarily with artistic directors Barnett, Chase, Wolken, and Michael Tracy, though Chase left in 2006, after having collaborated with Pendleton in 1980 to form the offshoot group Momix. Their performances have long been characterized by a strong element of physical interaction between the bodies of the performers, and exaggerations or contortions of the human form, often verging on gymnastics.